The Grumman F6F Hellcat was one of the most important fighter planes of the Second World War, described by many as a war-winning weapon. 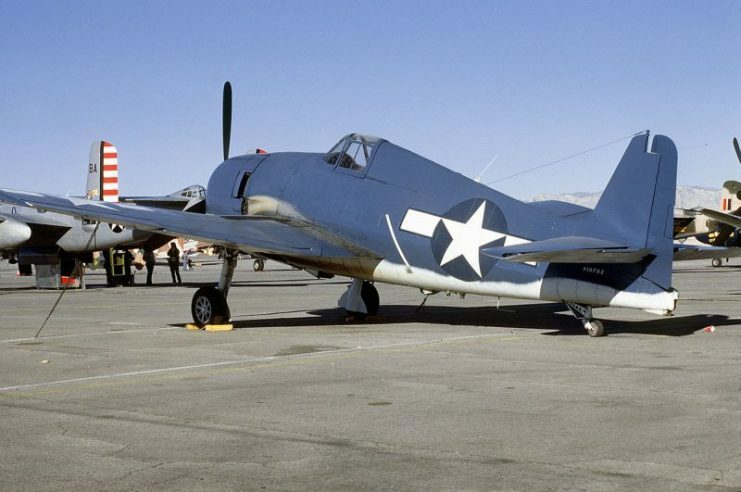 The Hellcat was developed as an improvement upon a previous Grumman plane, the F4F Wildcat. 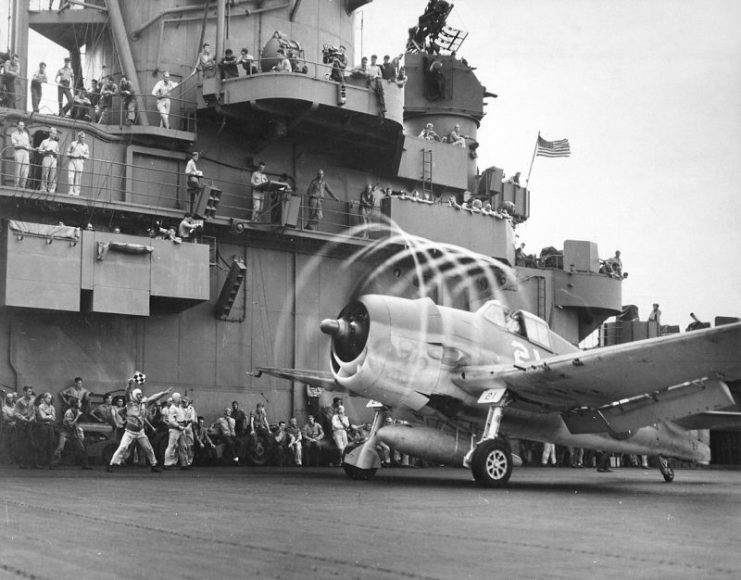 The Wildcat was seeing heavy use in the Pacific theatre of the war, where US Navy pilots flew it from both land bases and aircraft carriers. In the constant escalation of weapons technology, a central feature of this massive industrialized war, the Americans were keen to improve upon the design and find something more effective. The Hellcat was designed and produced at an accelerated pace. The first flight by a prototype took place on the 26th of June 1942, and by August 1943 is was being deployed in the Pacific. The power beneath the hood of a Hellcat came from a Pratt and Whitney R-2800 Double Wasp engine. This was an 18-cylinder, two-row, air-cooled radial piston engine with 2,000 horsepower. This engine gave the Hellcat a maximum speed of 386mph. 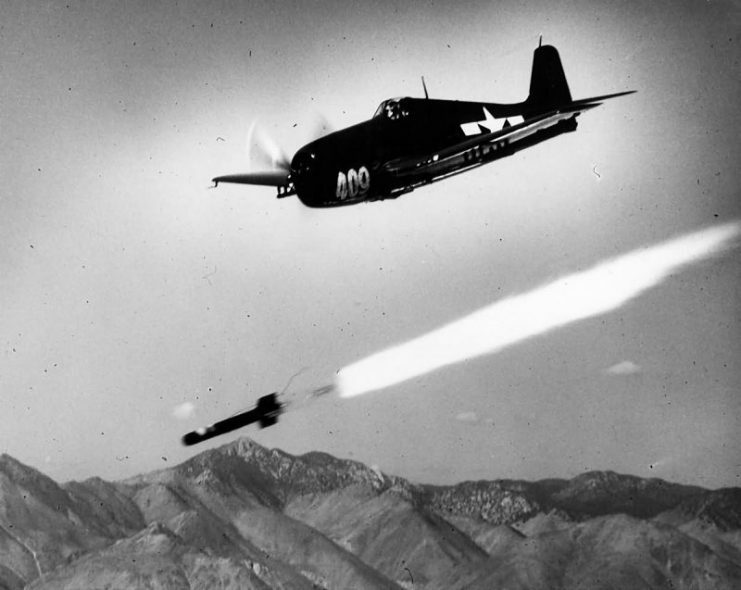 The Hellcat could climb to up to 37,000ft at a rate of 3,410ft per minute. It performed well at all altitudes, making it effective against both high-level bombers and low-level attacks by fighters and kamikaze planes. The Hellcat had the largest wings of any fighter in the Second World War, with a total area of 334 square feet. Because of the need to store it in the limited space of an aircraft carrier, their wings could be folded away. The Hellcat carried six 0.5in Browning machine-guns, fitted into the outer sections of the folding wings. Each gun was supplied with 400 rounds of ammunition. The Hellcat could also carry up to 2,000lb of bombs, which could be used against Japanese ships or in attacks on ground troops as the Allies launched their island-hopping campaign towards the Japanese mainland. Grumman F6F-3 “Hellcat” fighters landing on USS Enterprise (CV-6) after strikes on the Japanese base at Truk, 17-18 February 1944. Flight deck crewmen are folding planes’ wings and guiding them forward to the parking area. From the moment it entered service, the Hellcat swung battles in the Americans’ favor. The first large air battle fought by Hellcats took place on the 4th of December 1943, in the Kwajalein area. 91 Hellcats fought 50 Mitsubishi A6M Zeros, one of Japan’s most successful fighters of the war. The Hellcats shot down 28 of the enemy planes and only lost two of their own. F6F-5N Hellcat Nightfighter with Radar and 20mm M2 Cannons. In early 1944, a new version of the Hellcat was introduced. This night fighter had radar so that it could target Japanese planes in the dark. Able to fight effectively day and night, the Hellcat became a constant presence in the skies during the Pacific war. For the Japanese, this was a source of fear and tension. For the Americans, it was a source of comfort. They referred to this constant Hellcat cover as the “Big Blue Blanket”. 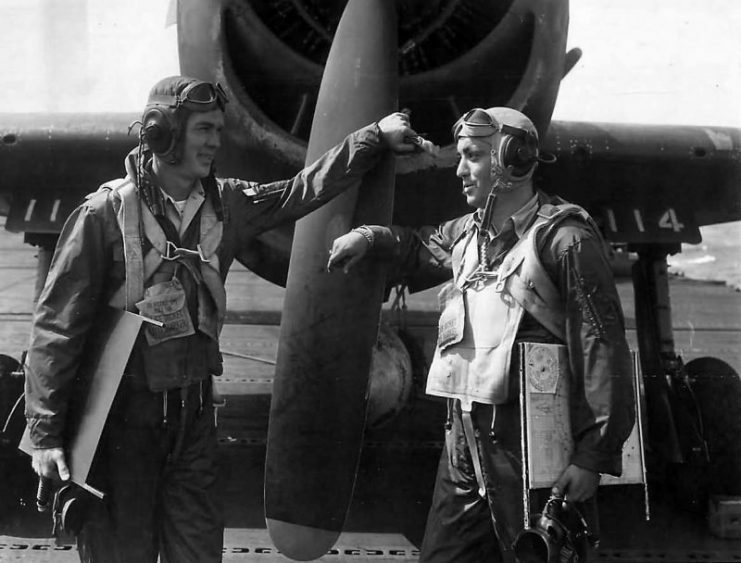 F6F Ace Pilots Coleman and Langdon of VF-83 on the USS Essex in 1945. 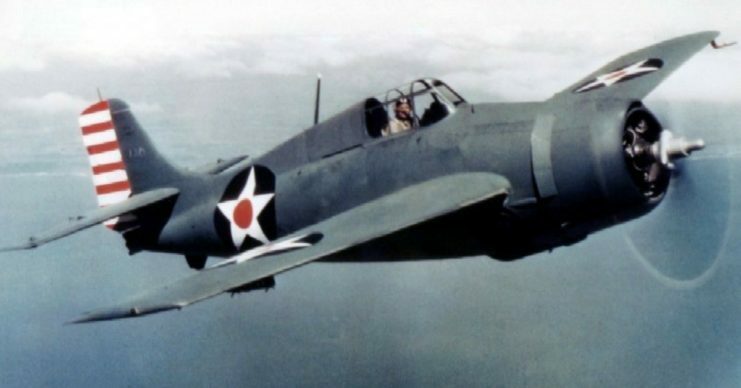 The Hellcat was a favorite of US Navy air aces – men who had shot down five or more enemy aircraft. Lt. Alex Vraciu defeated 19 enemy planes in a Hellcat, six of them during one eight-minute dogfight. 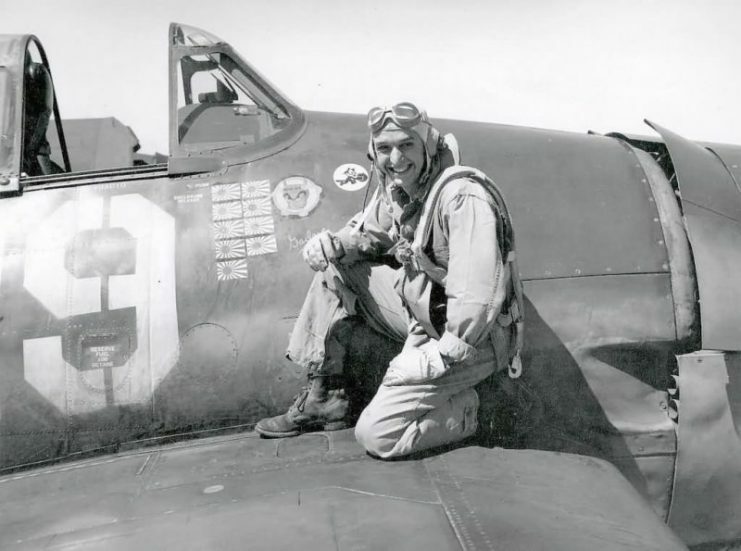 Lt. Bill Hardy earned his ace status in a single sortie in a Hellcat, when he destroyed five Japanese planes in 70 minutes on the 6th of April 1945. 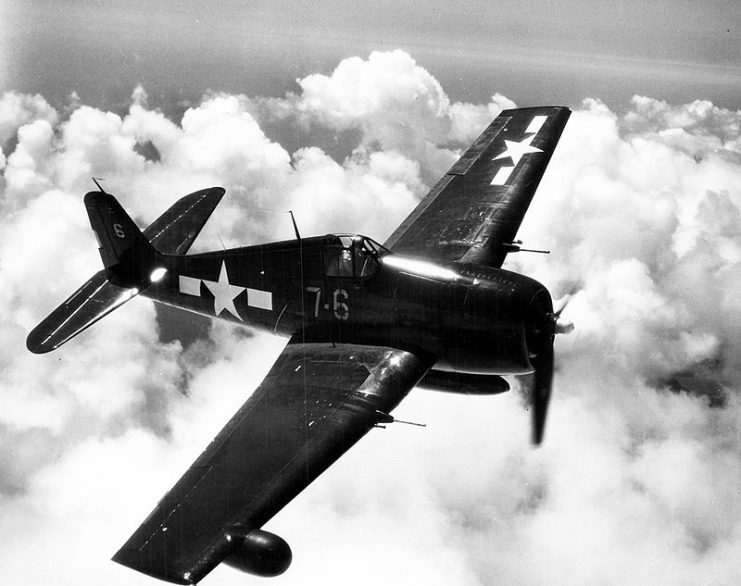 Vraciu described the Hellcat as “one hell of an airplane” – a fitting compliment for the devilishly named fighter. From April 1943, the British started receiving F6Fs as part of the Lend-Lease program, which America used to arm its ally. 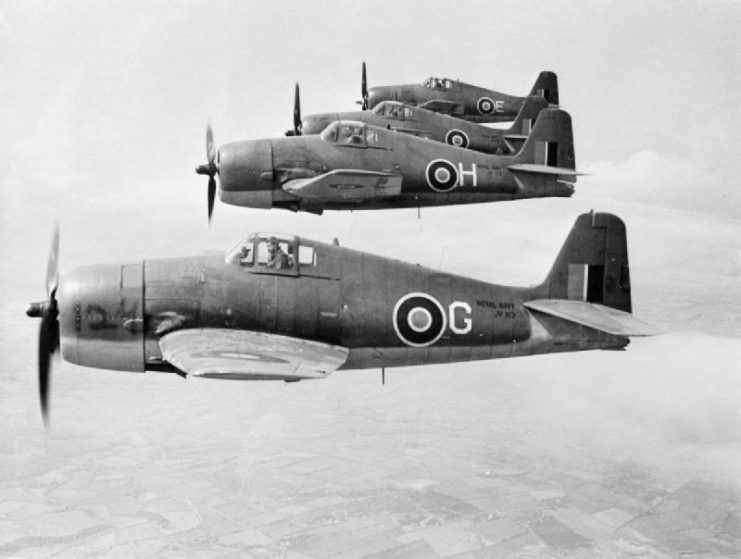 At first, they renamed these planes with the far more British title of “Gannet” instead of “Hellcat”. 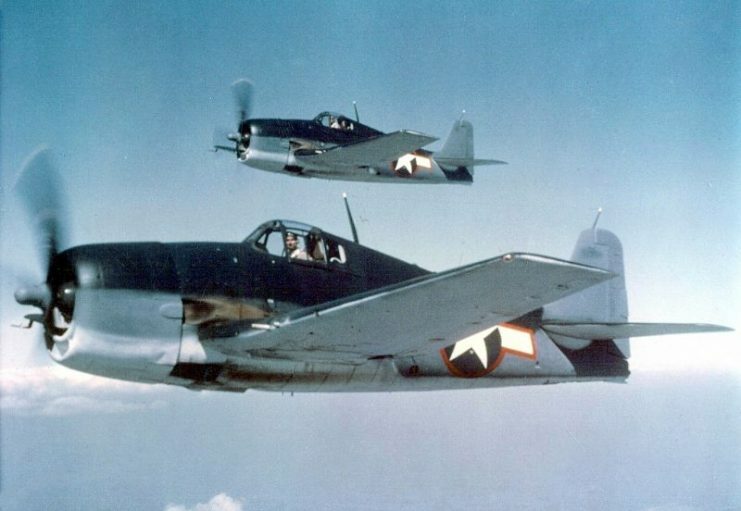 The British received 252 Hellcats, but these planes never became as important for the Royal Navy as they were for its US counterpart. 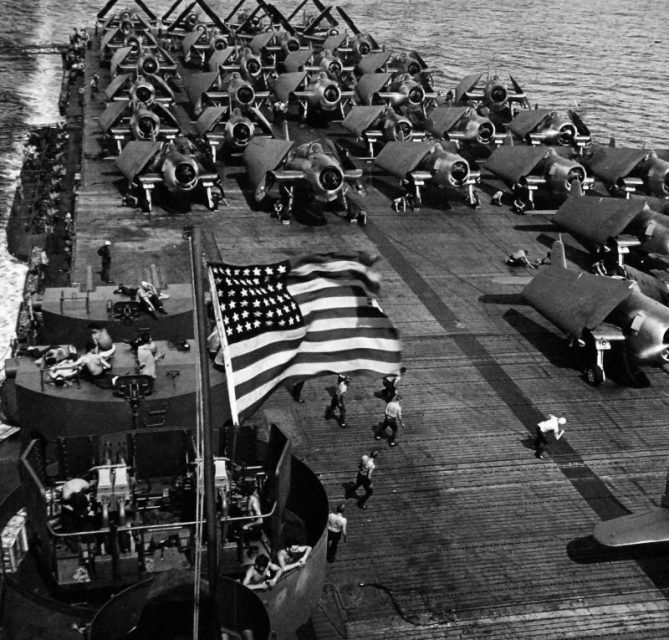 By the end of 1945, they had nearly all been replaced by other planes. Though quickly phased out by the Royal Navy, the Hellcat clearly remained popular with some of its pilots. One Fleet Air Arm officer carried on flying his Hellcat until 1953. 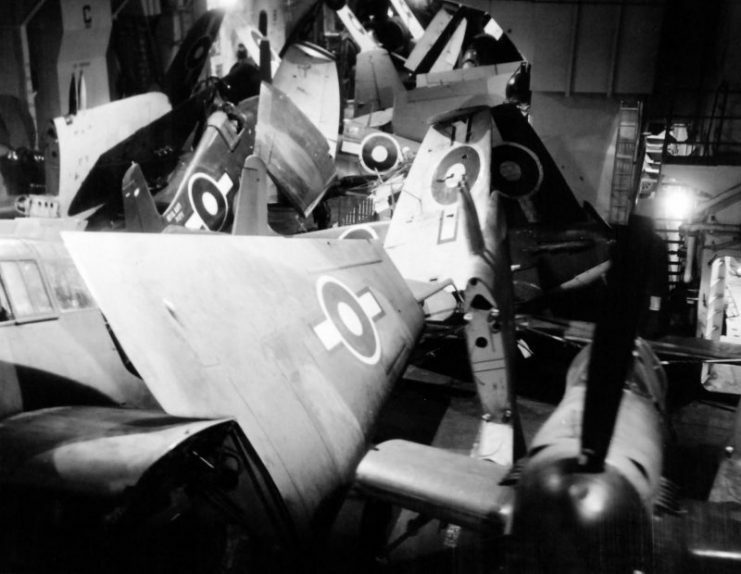 In the hands of the British Fleet Air Arm, Hellcats saw service around the world. They fought in the Far East, the Mediterranean and off the coast of Norway, as Britain engaged the Axis powers on multiple naval fronts. A formation of Hellcat F6F of the Fleet Air Arm of 1840 Squadron in June 1944. The quality of the Hellcat’s original design meant that few changes had to be made. As a result, it was possible to produce huge numbers of these planes in a short time. A total of 12,272 Hellcats were made. 11,000 of these were manufactured in just two years. 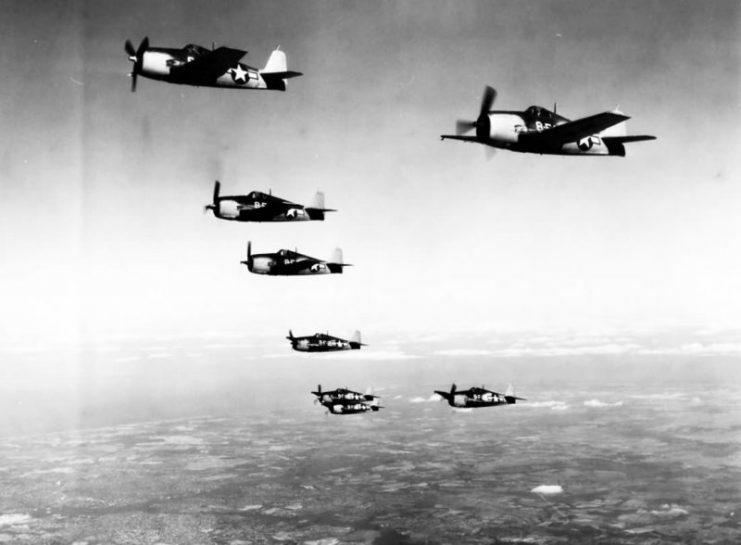 F6F-3 VF-8 Squadron in 1943. 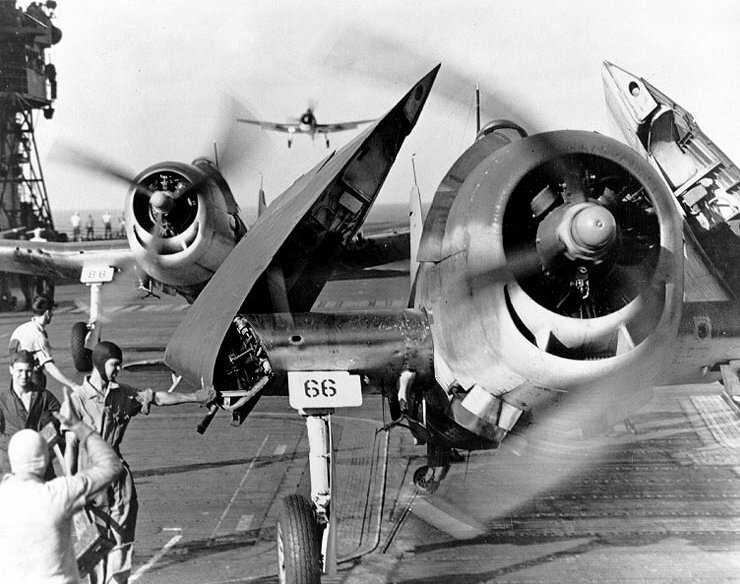 F6F-3 Aboard the USS Yorktown. The Hellcat was arguably the most successful aircraft-based fighter that America ever produced. 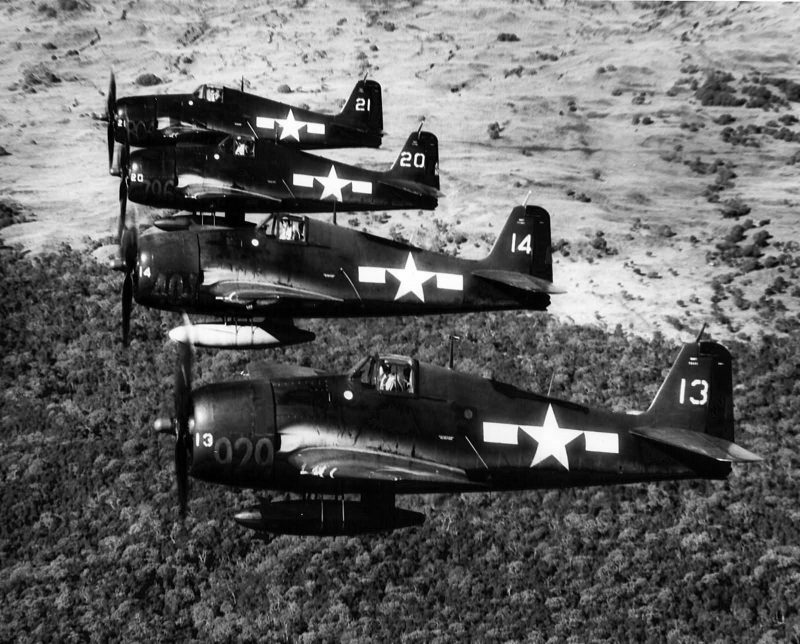 Over the course of World War Two, Hellcats claimed 75% of the kills by US Navy pilots, despite not arriving until over a year and a half into the war. They destroyed more than 19 enemy aircraft for every Hellcat lost. F6F aboard the USS Yorktown. Like many American planes, the Hellcat was also exported to other friendly countries. Besides from Britain, it was used by France and Uruguay. The latter two kept using Hellcats until 1961. In November 1945, the Hellcat production lines shut down. The end of the war meant a sudden drop in military spending. With thousands of these planes already in service, no more were needed. The future lay with the jet planes that had started to appear in the final year of the war, and which would fight each other for the first time in the skies over Korea. 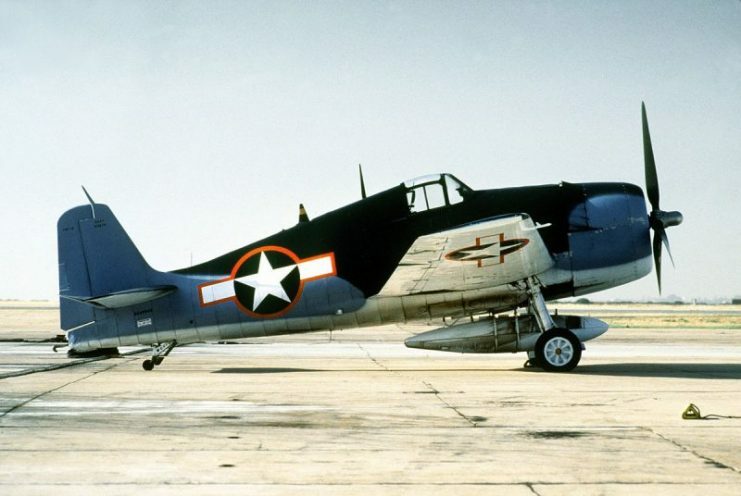 A Grumman F6F-3 Hellcat, in 1984. 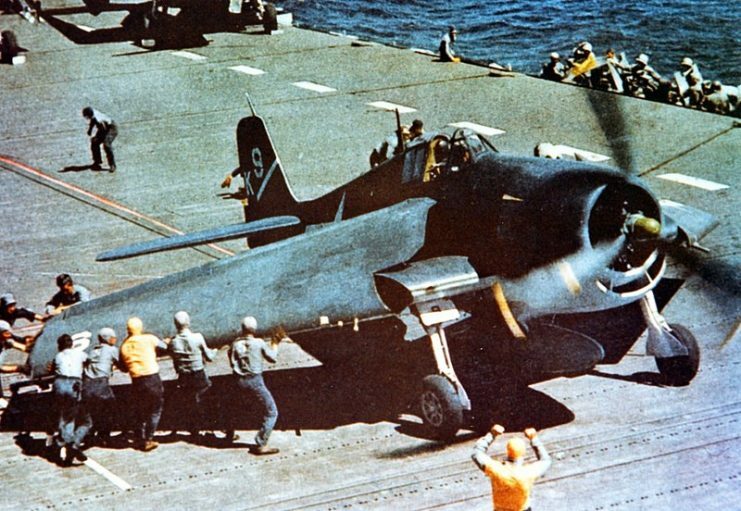 Though obsolete as fighters, some American Hellcats saw a final lease of life during the Korean War. Packed with explosives and turned into remote-controlled drones, they were used to attack North Korean targets.